Deciding where to place your new piano is an important decision, and must not be taken lightly. Because of their size, their inherent beauty and the sense of refinement and class that they bring, pianos will become a significant part to the room. Proper placement is important to make the most of the aesthetics, acoustics and protection of the instrument. Every room is different and needs to be thought through individually. Below are guides to placement. Pianos must be protected from UV and direct sunlight. This is a two-fold issue as the sunlight will cause the finish to fade and parts of the piano to prematurely degrade. The piano must not be placed near a heat or moisture source. It should be far from the kitchen and bathrooms, sprinklers and solariums. Open windows and doors where moisture and temperature changes will take place must also be avoided. This is because temperature changes will cause the piano to go out of tune. Excess heat will cause the piano to dry out which will impact the longevity of the instrument. Excess moisture may cause the wood to expand and damage the finish, degrade the tonal qualities of the piano and cause the internal components to corrode, swell, and not perform. The piano must be placed where it will not be subject to dirt or risk being damaged. Swinging doors, running children, pets, machines, and others may cause physical damage to the piano, damage the finish, and permanently compromise the musical qualities of the piano. 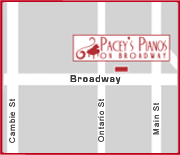 My family and I recently rented and then purchased a piano at Paceys Pianos. We were so pleased with the level of service throughout the whole process that we would recommend anyone deciding on a piano to choose PaceysPianos.